A bundle is a collection of products which are sold together. For example, a first aid kit may comprise a box, 3bandages, 10 plasters of different sizes, scissors and a sterile patch. The customer buys a first aid kit and the warehouse team pick the components and pack them together. A bundle may contain sub-bundles. For example, the first aid kit may be a box, 1 plaster and bandage set, scissors and a sterile patch. Generally, if the warehouse has pre-picked the plaster and bandage set (sub-bundle), then to save time, Warewolf allows the warehouse assistant (WA) to scan a barcode for the whole sub-bundle. 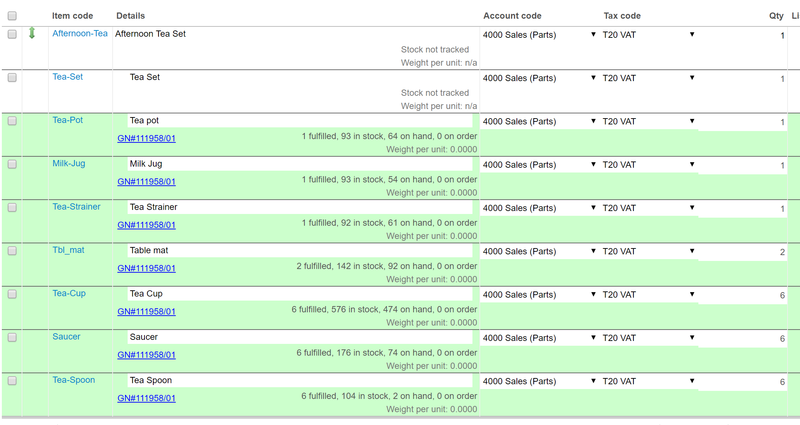 Similarly, Warewolf allows a bundle barcode to be scanned which covers every product in the bundle and its sub-bundles if any. With the bundles feature switched on, bundle items need to be picked together. For example, if the customer ordered a first aid kit and a wrist support and the WA scans a sterile patch, he will not be allowed to scan the wrist support until all the other bundle components have been scanned. When the WA scans a product within bundle, he will not be allowed to scan the bundle barcode. In settings>goods out, there are two settings to cover packing operations with bundles. With ‘show bundle components in packing switched off, the packing list works as if there are no bundles. Switched on, Warewolf groups the bundle components together but allows users to pack a sterile patch followed by a wrist support and then the scissors provided ‘pack bundled items together’ is switched off. Finally. With both settings switched on, Warewolf opens a modal when a bundle item is scanned and forces the WA to complete packing the bundle before moving on to other products. 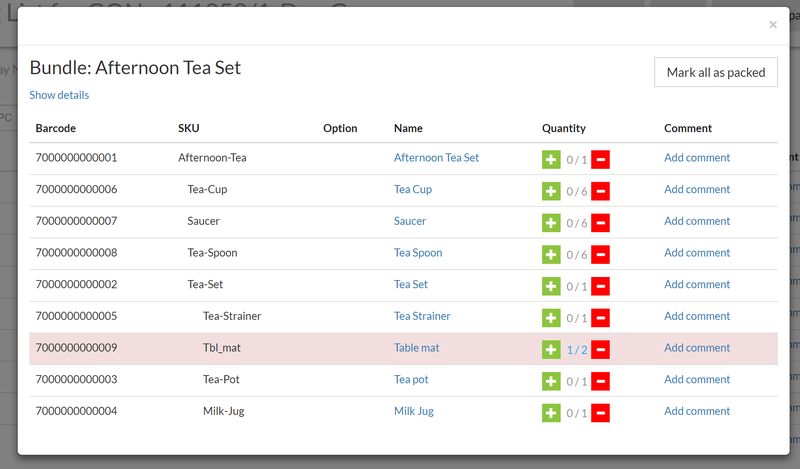 Below is an example order in the Brightpearl channel where the customer has ordered an ‘afternoon tea set’. This bundle includes a sub-bundle called ‘tea set’. When Warewolf opens the packing screen, the bundle is show rolled up with a down arrow next to it to indicate that it is a bundle. The WA can continue to pack products using barcode scanning or the + button as required. The ruses described above are enforced by Warewolf and appropriate messages are given to the WA should they transgress. 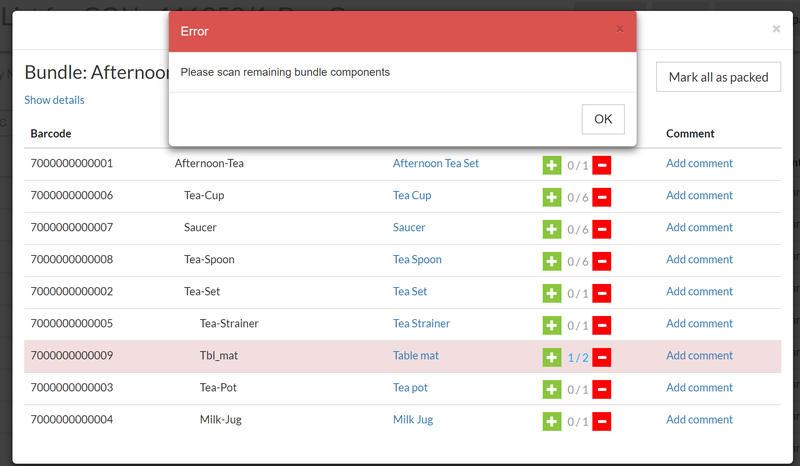 For example, continuing from the previous screenshot, the WA scans the barcode for the ‘tea set’, Warewolf reminds the WA to scan the bundle components. At any stage, the WA can use the ‘mark all as packed’ button to complete the entire bundle pack. The modal close button saves the scanned pack quantities, closes the modal and refreshes the main pack screen.